Firefighters aid victims in a deadly crash in Reseda on Saturday, Feb. 11, 2017. 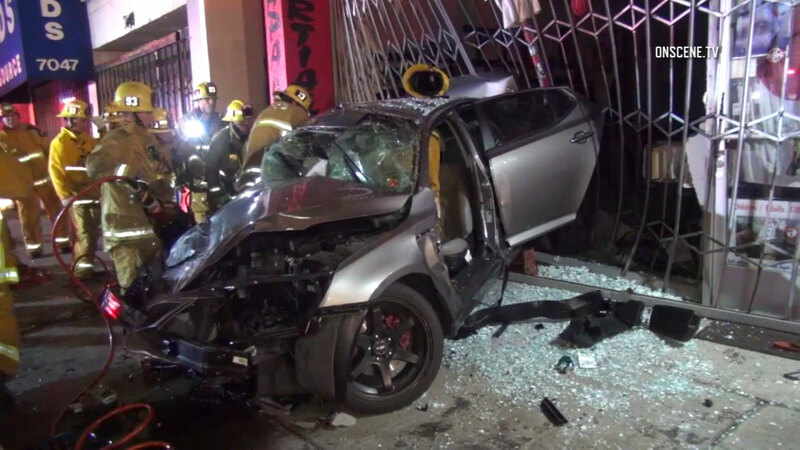 RESEDA, LOS ANGELES (KABC) -- Los Angeles police on Sunday were investigating what caused a deadly crash that killed one person and left another seriously injured in Reseda. Three cars were involved in the collision, causing one vehicle to slam into the wall of a store. The incident happened near the intersection of Reseda Boulevard and Gault Street about 10 p.m. Saturday, according to the LAPD's Valley Traffic Division. Two people were transported with serious injuries to a nearby hospital, where one of them later died.